Microalloyed steels are a type of alloy steels that contains small amounts of alloying elements (usually 0.05 % to 0.15 %). These steels are also sometimes called high strength low alloy (HSLA) steels. Though the work of strengthening steels through addition of small percentage of alloying elements started as early as 1916 in USA, the term ‘Microalloying’ (believed to be of Russian origin) was adopted by Prof. T. M. Noren-Brandel in 1962 and became pervasive as a result of the landmark conference ‘Microalloying 75’. Strengthening by microalloying elements permits a dramatic reduction in carbon content which greatly improves weldability and notch toughness. Microalloyed steels have been developed originally for large diameter oil and gas pipelines. The technology of microalloying involves the addition of a fraction of a percent of the microalloying elements to simple low carbon mild steel. The use of ‘micro’ alloy concentrations, which produce remarkable changes in mechanical properties, distinguishes the technology from ‘alloying’ in the conventional sense (low alloy steels family) where concentration of the alloying elements may range from 0.25 % to one or two or possibly several percent. Microalloyed steels are designed to provide better mechanical properties and/or greater resistance to atmospheric corrosion than conventional carbon steels. They are not considered to be alloy steels in the normal sense because they are designed to meet specific mechanical properties rather than a chemical composition. Microalloyed steels are a family of steels that contain 0.07 % to 0.12 % carbon, upto 2 % manganese and are strengthened by the elements niobium, vanadium and titanium added either singly or in combination. These elements are sometimes used in conjunction with other strengtheners such as boron, molybdenum and chromium, nickel, copper and rare earth metals. The microalloying elements are used to refine the grain microstructure of steels and/or to facilitate precipitation hardening in the steel. The use of these elements is also invariably accompanied by strict control of impurities such as sulphur, oxygen, nitrogen and phosphorus. Elements other than niobium, vanadium and titanium in microalloyed steels contribute for improved corrosion resistance and solid solution strengthening or enhanced hardenability. Vanadium is used to strengthen higher carbon steels. Vanadium nitride has powerful effect in increasing strength in steels. One of the main benefits of niobium is that it reduces the rate of recrystallization of austenite during hot rolling while one of the main roles of titanium is that of maintaining a fine grain size at high temperatures in the austenite range. Titanium is usually combined with vanadium and/or niobium. Molybdenum has played an important role in the initial development. The choice of microalloying element to use in steel is strongly influenced by the solubility of the microalloy carbide or nitride. The addition of 0.1 % to 0.2% molybdenum produces a fine grain structure of acicular ferrite and substantially enhances the precipitation hardening effects achieved with the other alloying elements. Microalloyed steels are preferably produced by a thermomechanical rolling process, which maximizes grain refinement as a basis for improved mechanical properties. Different types of microalloyed ferrite pearlite steels are given below. A fine grain size requirement is an essential requirement for the microalloyed steel to obtain the necessary strength and toughness properties. 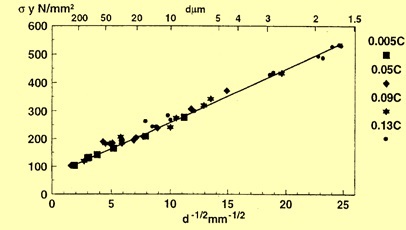 The relationship between lower yield strength and the inverse square root of the grain in C-Mn steels is shown in Fig 1. A similar relationship exists between grain size and fracture toughness. A fine grain size of around 10 ? m in low carbon steel obtained by controlled rolling provides good mechanical properties to which further strength can be added by making microalloy additions giving precipitation hardening. The various functions performed by the microalloying elements are given in Tab 1. The mechanical properties of the microalloyed steels are more than just the presence of the microalloying elements. The grain refinement of hot rolled microalloyed steels depends on the austenite conditioning which in turn is dependent on the complex effect of alloy design and rolling technique. Grain refinement by austenite conditioning with controlled rolling methods results into improved toughness and high yield strengths in the range of 350 to 600 N/Sq mm. This combination of controlled rolling process coupled with alloy design has produced increasing yield strength levels accompanied by a gradual lowering of the carbon content. Many of the proprietary microalloyed steels have carbon content of as low as 0.06 % or even lower, are yet able to get the yield strengths of 480 N/Sq mm. The high yield strength is achieved by the combined effects of fine grain size developed during controlled rolling and precipitation strengthening due to the presence of vanadium, niobium, and titanium. In order to realize the full strengthening potential of microalloying additions, it is necessary to use a soaking temperature prior to hot rolling that is high enough to dissolve all vanadium-bearing precipitates. A soaking temperature above 1100 deg C is preferred. For Nb–Ti microalloyed steel the single step austenite reheating temperature at 1150 deg C provides better austenite conditioning than the higher reheating temperature at 1240 deg C. Complete dissolution of carbonitride precipitates occurs at 1140 deg C in a temperature interval between 1100 deg C to 1200 deg C.
Microalloyed steels constitute an important category of steels estimated to be around 12 % of total world steel production. They are used in every major steel consuming sector and they have played an important role in the expansion of certain key industries. Some of their main application areas are given below.